Map of the pre-Roman Iron Age in Northern Europe showing culture(s) associated with Proto-Germanic, c. 500 BCE. The red shows the area of the preceding Nordic Bronze Age in Scandinavia; the magenta-colored area towards the south represents the Jastorf culture of the North German Plain. Proto-Germanic (PGmc; German Urgermanisch; also called Common Germanic, German Gemeingermanisch) is the reconstructed proto-language of the Germanic branch of the Indo-European languages. Proto-Germanic developed from pre-Proto-Germanic into three branches during the first half of the first millennium of the Common Era: West Germanic, East Germanic and North Germanic, which however remained in contact over a considerable time, especially the Ingvaeonic languages (including English), which arose from West Germanic dialects which remained in continued contact with North Germanic. The alternative term "Germanic parent language" may be used to include a larger scope of linguistic developments, spanning the Nordic Bronze Age and Pre-Roman Iron Age in Northern Europe (second to first millennia BCE) to include "Pre-Germanic" (PreGmc), "Early Proto Germanic" (EPGmc) and "Late Proto-Germanic" (LPGmc). While Proto-Germanic refers only to the most recent reconstruction of the common ancestor of Germanic languages, the Germanic parent language refers to the entire journey that the dialect of Proto-Indo-European that would become Proto-Germanic underwent through the millennia. The Proto-Germanic language is not directly attested by any coherent surviving texts; it has been reconstructed using the comparative method. Fragmentary direct attestation exists of (late) Common Germanic in early runic inscriptions (specifically the second-century Vimose inscriptions and the second-century BCE Negau helmet inscription), and in Roman Empire era transcriptions of individual words (notably in Tacitus' Germania, c. AD 90). The Proto-Germanic language developed from in southern Scandinavia (Denmark, south Sweden and southern Norway), the Urheimat (original home) of the Germanic tribes. It is possible that Indo-European speakers first arrived in southern Scandinavia with the Corded Ware culture in the mid-3rd millennium BC, developing into the Nordic Bronze Age cultures by the early 2nd millennium BC. Proto-Germanic developed out of pre-Proto-Germanic during the Pre-Roman Iron Age of Northern Europe. 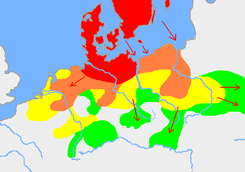 According to the Germanic substrate hypothesis, it may be influenced by non-Indo-European cultures, such as the Funnelbeaker culture, but the sound change in the Germanic languages known as Grimm's law points to a non-substratic development away from other branches of Indo-European. [note 1] Proto-Germanic itself was likely spoken after c. 500 BCE, and Proto-Norse from the 2nd century AD and later is still quite close to reconstructed Proto-Germanic, but other common innovations separating Germanic from Proto-Indo-European suggest a common history of pre-Proto-Germanic speakers throughout the Nordic Bronze Age. A number of Celtic loanwords in Proto-Germanic have been identified. By the 1st century AD, Germanic expansion reaches the Danube and the Upper Rhine in the south, and the Germanic peoples first enter the historical record. At about the same time, extending east of the Vistula (Oksywie culture, Przeworsk culture), Germanic speakers come into contact with early Slavic cultures, as reflected in early Germanic loans in Proto-Slavic. By the 3rd century, LPGmc speakers had expanded over significant distance, from the Rhine to the Dniepr spanning about 1200 km. The period marks the breakup of Late Proto-Germanic and the beginning of the (historiographically-recorded) Germanic migrations. The first coherent text recorded in a Germanic language is the Gothic Bible, written in the later 4th century in the language of the Thervingi Gothic Christians, who had escaped persecution by moving from Scythia to Moesia in AD 348. The earliest coherent text (complete sentences including verbs) in Proto-Norse become available c. 400 in runic inscriptions (such as the Tune Runestone). The delineation of Late Common Germanic from Proto-Norse about then is largely a matter of convention. Early West Germanic becomes available in the 5th century with the Frankish Bergakker inscription. The actual pronunciation of the "palatovelar" and "velar" series is not reconstructible; it may be that the "palatovelars" were actually plain velars, and the "velars" were pronounced even farther back (post-velar) so it may be more accurate to say that, for example, /k/ > /ḱ/ (see e.g. Ringe 2006, p. 87). Some also claim that the two series may not even have been distinct in PIE. See centum and satem languages. Loans into Proto-Germanic from other Indo-European languages can be dated relative to each other by which Germanic sound laws have acted on them. Since the dates of borrowings and sound laws are not precisely known, it is not possible to use loans to establish absolute or calendar chronology. From East Iranian came *hanapiz 'hemp' (compare Khotanese kaṃhā, Ossetian gæn(æ) ‘flax’), *humalaz, humalǭ 'hops' (compare Osset xumællæg), *keppǭ ~ skēpą 'sheep' (compare Pers čapiš 'yearling kid'), *kurtilaz 'tunic' (cf. Osset kwəræt 'shirt'), *kutą 'cottage' (compare Pers kad 'house'), *paidō 'cloak', *paþaz 'path' (compare Avestan pantā, g. pathō), and *wurstwa 'work' (compare Av vərəštuua). The words could have been transmitted directly by the Scythians from the Ukraine plain, groups of whom entered Central Europe via the Danube and created the Vekerzug Culture in the Carpathian Basin (6th-5th centuries BC), or by later contact with Sarmatians, who followed the same route. Unsure is *marhaz 'horse', which was either borrowed directly from Scytho-Sarmatian or through Celtic mediation. In some non-Germanic languages spoken in areas adjacent to Germanic speaking areas, especially the Finnic languages, there are loanwords believed to have been borrowed from Proto-Germanic like PGmc *druhtinaz 'warlord' (compare Finnish ruhtinas), *hrengaz (later *hringaz) 'ring' (compare Finn rengas, Estonian rõngas), *kuningaz 'king' (compare Finn kuningas), *lambaz 'lamb' (compare Finn lammas), *lunaz 'ransom' (compare Finn lunnas). Unvoiced fricatives appear as f, þ, h (perhaps /ɸ/, /θ/, /ɸ/). /ɸ/ may have become /h/ in certain positions at a later stage of Proto-Germanic itself. Similarly for /xʷ/, which later became /hʷ/ or /ʍ/ in some environments. Verner's law is usually reconstructed as following Grimm's law in time, and states that unvoiced fricatives: /s/, /ɸ/, /θ/, /ɸ/ are voiced when preceded by an unaccented syllable. The accent at the time of the change was the one inherited from Proto-Indo-European, which was free and could occur on any syllable. For example, PIE *bʰréh₂tēr > PGmc. *brōþēr "brother" but PIE *meh₂tḗr > PGmc. *mōdēr "mother." The voicing of some /s/ according to Verner's Law produced /z/, a new phoneme. Sometime after Grimm's and Verner's law, Proto-Germanic lost its inherited contrastive accent, and all words became stressed on their root syllable. This was generally the first syllable unless a prefix was attached. "The resulting /ɸ/ or /xʷ/ were reduced to /h/ and /hʷ/ in word-initial position." Even before the operation of Grimm's law, they were reduced to plain velars next to /u/ due to the boukolos rule of PIE. This rule continued to operate as a surface filter, i.e. if a sound change generated a new environment in which a labiovelar occurred near a /u/, it was immediately converted to a plain velar. This caused certain alternations in verb paradigms, such as *singwaną [siŋʷɡʷɑnɑ̃] ('to sing') versus *sungun [suŋɡun] ('they sang'). Apparently, this delabialization also occurred with labiovelars following /un/, showing that the language possessed a labial allophone [ŋʷ] as well. In this case the entire clusters [uŋʷxʷ], [uŋʷkʷ] and [uŋʷgʷ] are delabialized to [uŋx], [uŋk] and [uŋg]. All nasal vowels except /ɑ̃ː/ and /ũː/ occurred word-finally. The long nasal vowels /ɑ̃ː/, /ĩː/ and /ũː/ occurred before /ɸ/, and derived from earlier short vowels followed by /nx/. Note the change /e/ > /i/ before /i/ or /j/ in the same or following syllable. This removed /ei/ (which became /ũː/) but created /iu/ from earlier /eu/. Proto-Germanic had two overlong or trimoraic long vowels ô [ɔːː] and ê [ɛːː], the latter mainly in adverbs (cf. *hwadrê "whereto, whither"). None of the documented languages still include such vowels. Their reconstruction is due to the comparative method, particularly as a way of explaining an otherwise unpredictable two-way split of reconstructed long ō in final syllables, which unexpectedly remained long in some morphemes but shows normal shortening in others. 1 2 Comrie, Bernard (editor) (1987). The World's Major Languages. New York, New York: Oxford University Press. pp. 69–70. ISBN 0-19-506511-5. ↑ Bell-Fialkoll (Editor), Andrew (2000). The Role of Migration in the History of the Eurasian Steppe: Sedentary Civilization v. "Barbarian" and Nomad. Palgrave Macmillan. p. 117. ISBN 0-312-21207-0. ↑ Nakhleh, Luay; Ringe, Don; Warnow, Tandy (June 2005). "Perfect Phylogenetic Networks: A New Methodology for Reconstructing the Evolutionary History of Natural Languages" (PDF). Language - Journal of the Linguistic Society of America. 81 (2): 1, 10. Retrieved 2016-10-13. The Germanic subfamily especially seemed to exhibit non-treelike behavior, evidently acquiring some of its characteristics from its neighbors rather than (only) from its direct ancestors. [...] [T]he internal diversification of West Germanic is known to have been radically non-treelike [...]. ↑ Cunliffe, Barry (2008). Europe Between the Oceans 9000 BC - AD 1000. New Haven: Yale University Press. pp. 303–7, 352. ↑ McMahon, April M.S. (1994). Understanding Language Change. Cambridge University Press. p. 227. ISBN 0-521-44665-1. ↑ Fortson, Benjamin W. IV (2010). Indo-European Language and Culture: An Introduction. Blackwell Textbooks in Linguistics (2nd ed.). Global: Blackwell Publishing. p. 342.